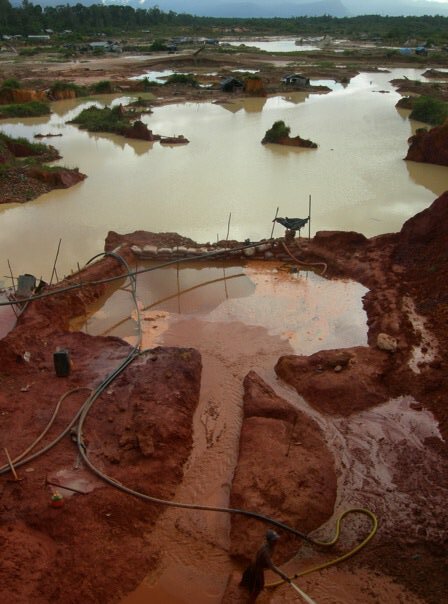 Las Cristinas, Venezuela’s most promising gold resource, 2009. Courtesy of BM. I can’t stop thinking about the fact that Venezuela’s central bank bought 40% of the country’s state gold miner from the state oil company and paid $12 billion. That values the company as a whole at $30 billion. We know from Rusoro and a series of other gold companies, some of whose names can not be spoken aloud, that mining for gold in Venezuela is barely, if at all, profitable. The output must be sold at the official exchange rate. That means that gold prices in Venezuela are the cheapest in the world. It gives some employment to an otherwise depressed part of the country, sure. And the central bank probably does build up a few ounces a year of gold holdings from these mines. But $12 billion. That is a lot of money. By comparison, Rusoro, which had real mines and real employees, and actually tried to mine the resources profitably, even months before it lost its mines to the government, had a market capitalization of less than $100 million. Why? Why would the BCV make such a fiction as to pay $12 billion dollars for a near-worthless asset? Why do an 11-digit transaction? All I can wonder is whether someone got the usual M&A commissions. I don’t know, but if the commissions were set up proportionately to the year’s other deal of the same order of magnitude, commissions may have been in the tens of millions of dollars: advisor fees for the Glencore-Xstrata deal were reportedly $140 million, on a transaction valued as high as $90 million. If someone did get a commission here, I suppose they earned it. UPDATE June 27: BCV got a bargain. PDVSA previously said the gold company was worth $40 billion. This valuation appears to be a simple multiplication of proved ounces x gold price, as though there were no costs involved in extracting gold, no risk of gold price changes, and no political risk. That makes sense. UPDATE2: Gustavo Coronel blows a fuse. UPDATE3 June 29: As Gustavo rightly points out, the only known asset of this particular state gold miner is the Las Cristinas-Brisas gold and copper deposit, which has had quite a history. Earlier, I referred to Venezuelan gold output, but that is all at Minerven. This entry was posted in Uncategorized and tagged gold, scandal, venezuela on June 26, 2014 by Steven Bodzin. There was a time when I took some pleasure in finding concealed admissions of weakness hidden within the rosy financial results of Venezuela’s state oil company. Today, I read them and I am just embarrassed. Writing about these numbers is like watching the end of bullfight. The once mighty beast is crippled, bleeding and it seems in bad taste to stare. This entry was posted in Uncategorized and tagged debt, earnings, pdvsa, venezuela on June 25, 2014 by Steven Bodzin. In case you haven’t noticed, I have been posting here very little. I have been tweeting more at @guacamayan. over there I have a more catholic approach to the world. I am not writing exclusively about energy and Latin America, but rather allow myself to express opinions and share news about anything that crosses my mind. I hope it’s useful and informative to some. I have, in fact, been writing a lot, but mostly for pay. I also have some draft posts behind the curtain here, some of which will go public one day, probably after I am once more able to use my right hand and can thereby operate the keyboard once more. I think every one-person website is going to go through phases, and blogs are definitely not where the kids are going for their information these days. But all the same, I will keep posting here at some point. Keep in touch. This entry was posted in Uncategorized and tagged housekeeping on June 18, 2014 by Steven Bodzin.